A line of Thesiger's porters wading along a stream or khor, holding baggage on their heads. 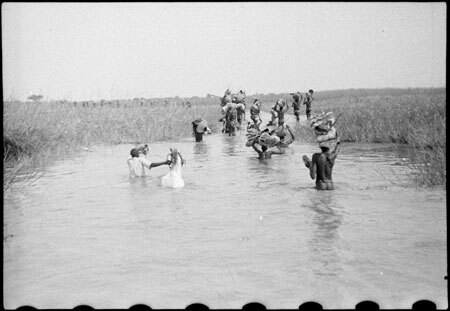 One of Thesiger's horses is also being waded through the water. On his first four month trek in Western Nuerland Thesiger employed about thirty porters at a shilling a day, who each carried about forty pounds in weight. Thesiger conceded that many of the porters were necessary simply to carry food for the others. Morton, Chris. "Nuer porters in stream" Southern Sudan Project (in development). 03 Jan. 2006. Pitt Rivers Museum. <http://southernsudan.prm.ox.ac.uk/details/2004.130.36012.1/>.